Let’s take a good look at the Sun Joe SPX 3001 in this review. As a water and fire damage restorer; and home improvement experts, we have used electric power washers to clean appliances, basements, ground in dirt/soot from tiled floors. We have removed paint from the outside of homes, cleaning roofs, retaining walls, patios, walks, and driveways. The main use for an electric pressure washer in our industry is to use inside of a home where a gas pressure washer is just unrealistic because of the carbon monoxide emissions they expel. Dragging a hose inside while leaving a gas unit outside will only get you as far as the hose will allow. Electric pressure washers are also a great choice if you are elderly due to the lightweight and easy to connect oversized fittings. Homeowners that don’t have a lot of storage space but need to keep their home clean inside and out. The car enthusiast that loves to clean or details their vehicles inside a garage. There really is an endless use for a good electric pressure washer. 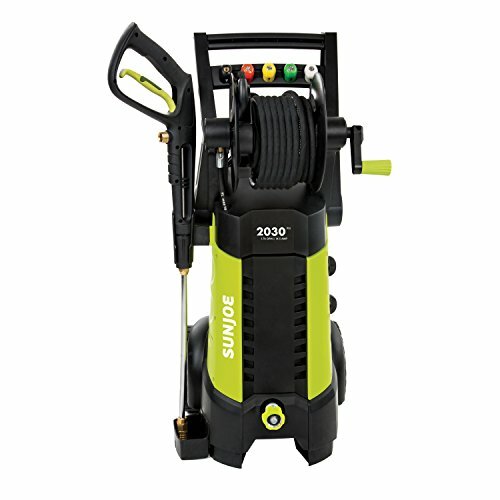 This is the reason we at Water Damage Restoration Dallas Texas, bring you reviews such as the Sun Joe SPX 3001 review, to arm you with the knowledge you need to make an informed decision on the pressure washer that fits your lifestyle. Who Makes The Sun Joe Pressure Washers? Snow Joe and Sun Joe products are manufactured in New Jersey, U.S.A. and come with a two-year warranty for most products. You can even add on extended warranties at purchase. Sun Joe spx30001 2030 psi 1.76GPM; the PSI (that’s pounds per square inch btw) and delivers a whopping 1.76 GPM that should be enough water and pressure to get what you need to be cleaned in a hurry. Add a 14.5 AMP Electric motor with GFCI plug, an onboard Hose Reel, and nozzle tip storage, that is light and portable then you have the Sun Joe SPX 3001. This machine can’t be found at your local Wal-Mart, Lowes, and/or Home Depot box stores. You can find them at several e-commerce stores including Amazon. I found a lot of questions that people have asked about this pressure washer and after checking it over personally…. Q: How Much Hose Does The Hose Reel Hold? A: The reel holds 20 feet of pressure hose. It could hold more if it wasn’t for the connectors that attach the hose and extension. It is rather bulky and stiff for the reel to turn. Q: What Fitting Can You Use To Join An Extra Length Of Pressure Hose? A: You will need a male to male 15mm coupling adapter. Also known as M22 to M22, or hose to hose. Make sure that your pressure washer is not an odd size such as the common 14mm. Q: Can You Use Warm Water? A: No, this power tool is rated as a cold water pressure washer. Hot or warm water may cause problems to the pump. Q: Can You Use The Sun Joe SPX 3001 To Remove Chipping Paint Around Windows And Doors? A: Most definitely you can. I would use extra caution around windows or doors that have glass in them because of the high pressure could break the glass. Start with the 40-degree nozzle tip about 8 to 10 inches away from the peeling paint. Q: Pressure Washing a Deck Does You Have To Re-stain Afterward? A: No, not unless you want to re-stain. I would clean the deck using the soap tip then followed by a good scrub brush. Only clean an area big enough that will not let the soap dry on the deck. Then switch from the soap tip to the 40-degree nozzle tip to rinse. Let dry a few days if you plan on re-staining or painting. According to consumer reports Sun Joe SPX3001 was rated as one of the best electric pressure washers. I don’t know about it being the best, especially after reviewing the Karcher pressure washer, but I’ll leave that for the Final Verdict coming up in a moment. Comes with 5 Quick-Connect spray tips (0º, 15º, 25º, 40º, turbo nozzle and soap) in a convenient color-coded tool tray that is on the front handle of the pressure washer. Just grab the tip you need and put back in place when you’re done. For an electric pressure washer, 2030 PSI/1.76 GPM is really good for maximum cleaning power in or around any residence. The onboard hose reel is a nice add-on for keeping your hose organized when not in use. One feature that I love about this machine is the total stop safety system…. It automatically shuts off the pump when the trigger is not engaged to save energy and to prolong the pumps life for a greater lifespan. This power washer is awesome. Time will only tell if it holds up. Sun Joe does allow the customer to purchase an additional warranty for the product once it has been registered on their site. Three years extra protection for a negligible amount will be well worth it considering the seals in the machine can fail after a few years. I highly recommend this power washer. It is great! The Pressure Washer has a 1.2-liter removable soap dispenser allows you to take the detergent tank to the sink and fill with your favorite soap or clean after use, that rounds out this pressure washer. I notice that the Sun Joe SPX3001 tips over easily because the design makes this machine a little top heavy. I do suggest that before you use your pressure washer that you unroll the hose all the way out before work. The hose caddy and handle assembly are not as stable as I would like and could possibly break if you do not watch how you remove or put away the hose on this reel. Follow the tip above and when you roll your hose up back it up against a wall or use your leg or hip to stabilize the pressure washer while you put away the hose. Something that I have noticed from other reviewers is the water hose connection is a thin wall plastic and could easily cross thread when you screw on your garden hose. To avoid this you can purchase a brass adapter. The soap dispenser according to several reviewers, says that the siphon doesn’t always work. This problem could be due to not cleaning the siphon hose after each use and getting clogged. Most of the complaints came after using them…. Sun Joe products seem to be leading the field when it comes too environmentally friendly (clean energy,) alternative to fossil fuels products. This was the first electric power washer I came across that went beyond the 2000 PSI rated power tool. You can keep searching for pressure washers or you can click here for speedy shipping and your own brand new Sun Joe SPX3001, reliability you can trust. This machine will have no problem cleaning just about anything in or around your home including grease stains on driveways and garage floors. It has the power to deliver that gets the job done fast. Due to the cons on this reviews list, I rate this power tool at three in half stars. If it wasn’t too heavy that would have added the other half star.